The year 2018 has kicked off with a flurry of UFO sightings (CE-1s, in the Hynek classification) in Argentina and Mexico, fanning hopes for a year of intense anomalous activity in both hemispheres. The efforts made by Luis Burgos and his team with the Fundación Argentina de Ovnilogía (FAO) are nothing short of heroic; the same can be said of Alfonso Salazar’s devotion to documenting the presence of anomalous objects that appear persistently over a specific part of his country: Mexico City’s International Airport (MCIA), whose case histories have become known to readers of INEXPLICATA over the past decade or so. When Christianity became the official religion of the Roman Empire, the use of bells as religious instruments came into vogue, despite the fact that they had been employed for religious purposes for thousands of years as far away as China and India, where some truly impressive specimens existed. In the year 604, Pope Sabinian, appointed by the Byzantine court in Constantinople, recognized the importance of bells in the liturgy, and even the most distant communities in Europe began to adopt them. They are mentioned in the works Saint Caesarius of Arles (AD 513) as well as in the Benedictine Rule (AD 540). However, when restrictions on the use of these magnificent instruments appeared in the 8th century, forbidding the ringing of bells during the three days prior to resurrection, a curious belief circulated among Medieval peasantry to account for their silence - the that bells would leave their belfries and fly to Rome be closer to the Pope. A charming thought, for sure. But was there something else at work? Bells were the source of a number of superstitions (most commonly that the sound of bells will bless the marriage and insure the happiness of newlyweds), but we also have stories of bells flying through the air at high speed, faster than the swiftest birds known to the Medieval mind. Even more suggestive folktales described bells flying low over the countryside, emitting a reddish glow and rumbling sound. The sudden manifestation of one of these "flying bells" was considered a bad omen. In France, this belief survives in the old Easter tale of Floribert and Marguerite, the children of the local bell ringer, whose story took place one Easter week long ago. "As you well know," reads the fairy tale, "bells fly off to Rome to bring children eggs made of sugar and chocolate." 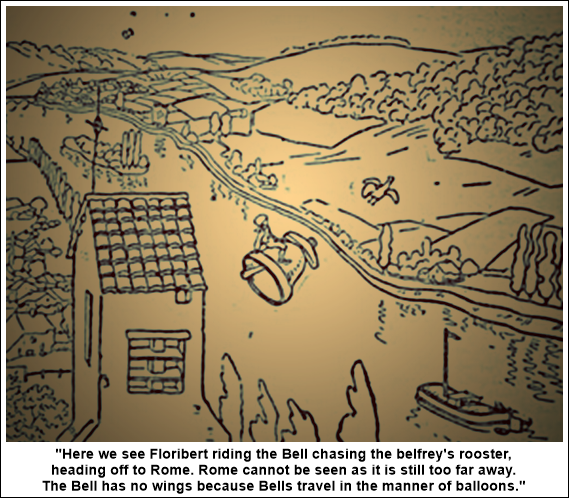 Floribert asks his church bell to take him to see the Eternal City, and the bell agrees. 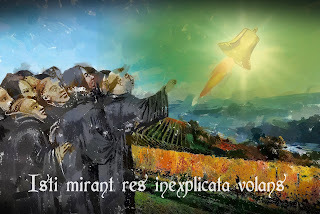 In flight, "they saw other bells from unknown towns, also on their way to Rome. 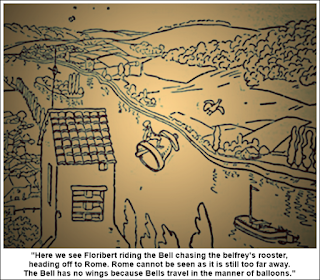 Floribert's own bell would move its clapper to engage its metallic kin in conversation. Upon reaching their destination, the bell deposited the boy outside the city walls, saying that it had to go 'to be blessed' and fetch Easter eggs." 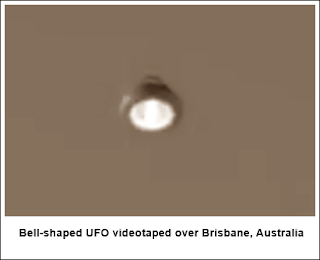 As recently as May 1, 2014, a bell shaped UFO was photographed over Boise, Idaho - an image that can be found circulating on the Internet. A similar one visited Turkey in 1998, and still another was videotaped over Brisbane, Australia in 2015. Were similar objects responsible for swaying medieval thought toward a belief in flying bells? Extraterrestrial visitors conducting a survey of a rather primitive world racked by barbarian invasions and famine, deploring humanity’s lot? Ultraterrestrials playing their timeless games with humanity, or perhaps even sinister, time traveling artifacts like the Nazi device known as The Bell? We can speculate endlessly while we wait for our Easter candy.